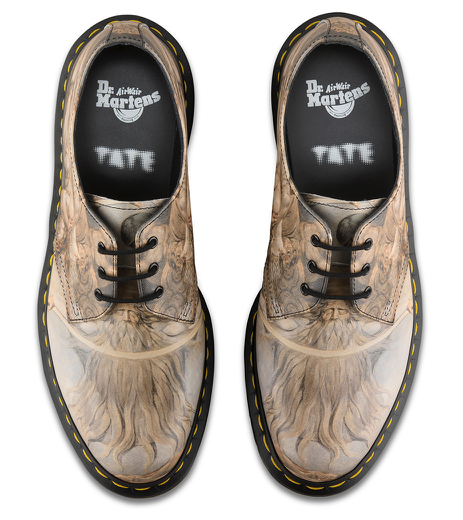 Dr. (Doc) Martens, the footwear/clothing/accessory company, currently has a Blake collection in collaboration with Tate Britain. I asked them about it (the conversation has been edited slightly). How does Blake fit with the philosophy of Dr. Martens? William Blake was a natural renegade and definitely an unusual figure in his day. As a poor and penniless artist, Blake worked hard to seek out commissions, and he also self-published pamphlets of prints and poetry. This free-thinking, creative, and pioneering attitude is not dissimilar to the punk DIY ethos that Dr. Martens is synonymous with. Also, as a British painter, he represents the proud British heritage of Dr. Martens as a brand. How did the collaboration with the Tate come about? 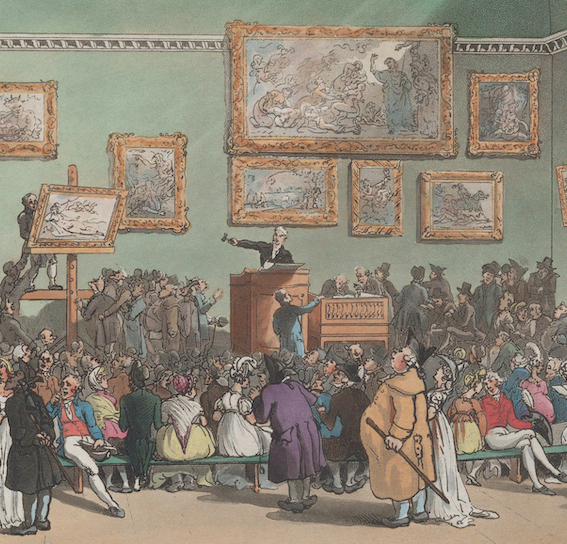 The Blake collection was very much collaborative, with many members of the team being fans of either his artwork or poetry. We worked closely with the curators at Tate Britain to select Blake’s most iconic works of art and ones that would resonate with our wearers. Which leads to the process of choosing the particular images: Satan Smiting Job with Sore Boils and The House of Death. What design/stylistic considerations do you have? The House of Death is a well-known Blake painting that’s based on the work of John Milton and the painting has many layers and meanings, making it a very interesting piece. Satan Smiting Job with Sore Boils is such a bold painting and visually it’s very arresting. Both of the works are quite dark in subject matter and it’s the juxtaposition between that and the beauty of the paintings that is interesting. How are the pieces manufactured, e.g., how do you apply the images to the leather/fabric? The images are digitally printed onto a high-quality leather so that the finished articles do the artworks justice—the quality is extremely crisp. The wonders of technology are able to bring to life Blake’s famous paintings and the prints are all done using an extremely clever machine. It’s great when you can use modern techniques with time-honored construction to make something truly unique. Talking of something unique, the team at Dr. Martens is generously offering a pair of shoes from the Blake collection for us to give away. The prize is one pair of Dr. Martens William Blake collection shoes plus shipping to the winner’s address. If Dr. Martens no longer has the Blake collection shoes in the winner’s size, it will send another style. To enter you need provide just your name and an e-mail address, which will be used only in the case that you are the winner. One entry per person. Please refrain from entering if you are on the staff or editorial board of the Blake Quarterly (contributors and subscribers may certainly enter) or if you work for the Blake Archive. Please don’t enter if you’ve previously won a prize from us. Most importantly, if you are the winner and a US taxpayer you must agree to complete and return a W9 form before the prize can be shipped. It is your responsibility to pay income tax on the value of the shoes (US $130.00). If you are the winner and not a US taxpayer it is your responsibility to determine any tax obligation in your country. You are also responsible for any VAT or duty that may be charged. Unfortunately this giveaway is not open to residents of Quebec. Other Canadian residents may enter but must answer a skill question before the prize can be awarded. Here’s the link to enter. We’ll draw the winner on 13 December. Good luck! Huge thanks to Sara LaHaie, US brand marketing and PR manager for Dr. Martens, and Alexis DeBrunner, account executive at Exposure America, for making the Q&A and the giveaway possible.